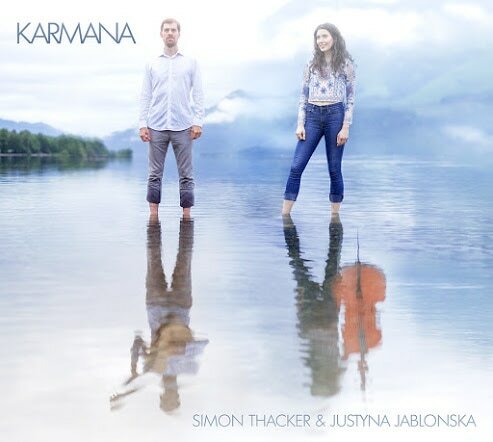 Simon Thacker – classical guitar, Justyna Jablonska -cello, with special guests, Karine Polwart -voice, Masha Natanson -voice/violin, Sarvar Sabri- tabla. Simon Thacker’s impressive ethnomusicological intelligence and prodigious instrumental technique is already known to us through his wonderful Indo-fusion disc, `Savra-Kanti` of 2013. In his latest recorded offering, Karmana (a Sanskrit word meaning “performing anything by means of magic”) he widens his choice of source materials to add Balkan, Spanish and Gaelic influences to his abiding passion for Indian forms, whilst interpreting them via the creative impulses we associate with the contemporary avant-garde imagination. On this occasion all the music has been composed and synthesised by Thacker who, in its realisation, is partnered by Polish cellist, Jablonska, who having maintained a musical relationship of some three years is perfectly in tune with his visionary aims and is matched in virtuosity. The eponymous centrepiece of the programme is a six movement suite for guitar and cello which expands raga forms to accommodate the harmonic textures and rhythmic subtleties of wider musical forms contrasting Dionysian passion with Apollonian serenity. Thacker’s encyclopaedic sleeve notes give a far more comprehensive account of the music’s aetiology than I could ever attempt, so let’s leave it there. The music, though ambitious, is sufficiently accessible to be enjoyed on its own terms. What follows is equally compelling: a headlong dance inspired by Carpathian folk music; a Roma song propelled by Manouche rhythms and an arrangement of a Gaelic ballad for cello and re-tuned guitar; all excellently varied and beautifully performed, but nothing quite prepares you for what comes next. “Ruaigidh Dorchadas/The Highland Widow’s Lament” is a powerful, thirteen-minute threnody inspired by turbulent events in Scottish history which employs the backwards recording technique pioneered by Jimi Hendrix and used sparingly in Thacker’s last disc. Allied here to the multi-tracking of guitar and cello and added sampled sounds it creates an unsettling aural environment that frames a plaintive lament sung to words by Robert Burns on the tragedy of Culloden. It is a piece that stays with you long after it fades into silence. The recital finishes on an up-beat note with a return of Indian allusions and the rhythmic vitality of the tabla over which the duo weave and converse in an exhilarating and colourful dialogue concluding another triumph of musical syncretism that is a delight to the ear and a stimulant to the senses.